The gold standard for food nutritional comparisons is undoubtedly McDonalds’ “Big Mac.” Bloggers and posters everywhere love to compare an item, especially one that is positioned as healthy, against the famous “Big Mac” burger. Inevitably, this comparison leads to a headline like: “Healthy salad has more fat than a Big Mac!” Although attention-getting, it’s important to understand if it’s really true. In this case, the comparison is Core Greens, Grains & Bone Broth’s “Southwest Chicken and Wild Rice Grain Bowl” vs. the famous “Big Mac” burger. Let’s explore. The culprit is fat grams. “Big Mac” weighs in at 33 grams while the “Southwest” bowl tips the scales at 52 grams. First off, let’s start with portion sizes. This is where many comparisons fail. In the case of the “Big Mac,” its portion is listed at 219 g or 7.6 oz total. The “Southwest” bowl weighs in at 497 g or 17.75 oz. That’s more than twice as much actual food! That’s why almost all “Big Macs” are sold into a combo meal with at least a medium size fry, which adds another 380 calories and 19 grams of fat to the meal. The “Big Mac” is simply just part of a larger meal, where other unhealthy foods must be added, while the “Southwest” bowl is an entire, filling meal on its own. For a fair comparison, either a medium fry or another “Big Mac” should actually be added to the equation. Avocados are considered to be one of the most nutrient dense foods and almost all of the fat they contain is “good” plant-based fat that is beneficial in fighting inflammation. Additionally, they contain high levels of fiber, potassium, and key vitamins. Meanwhile, studies indicate that grapeseed oil has properties that are anti-inflammatory, antioxidant, anti-histamine, anti-aging, anti-allergic, antimicrobial, and adaptogenic activity. Grapeseed oil is also high in beneficial oils that help the body function and recover well. It’s considered to be among the most heart-healthy oils today. The grilled chicken in the grain bowl contributes mostly to the rest of the fat. That chicken grilled breast is humanely raised and never given antibiotics. In addition, we marinate that chicken prior to grilling and our marinade is made in-house from canola oil, balsamic vinegar, fresh garlic and gluten-free fermented shoyu sauce. Our “Southwest” bowl is a nutrient dense meal. It’s power-packed, meant to provide long-lasting energy and increased performance. If you’re looking for lower calories and fat, we offer a “side” size of any of our entrees that are about half the size of the standard items. Also, there are many other lower calorie and lower fat options, if you choose. Core Greens, Grains & Bone Broth offers a number of ways for its customers to eat healthy. Not all are low fat or low calorie as some items are designed for lasting energy and performance. But we are proud of our commitment to clean, real, and great tasting food and want to be a guide for eating for performance! We hope you keep our ingredients and intentions in mind when comparing our meals to fast food and unhealthy options. 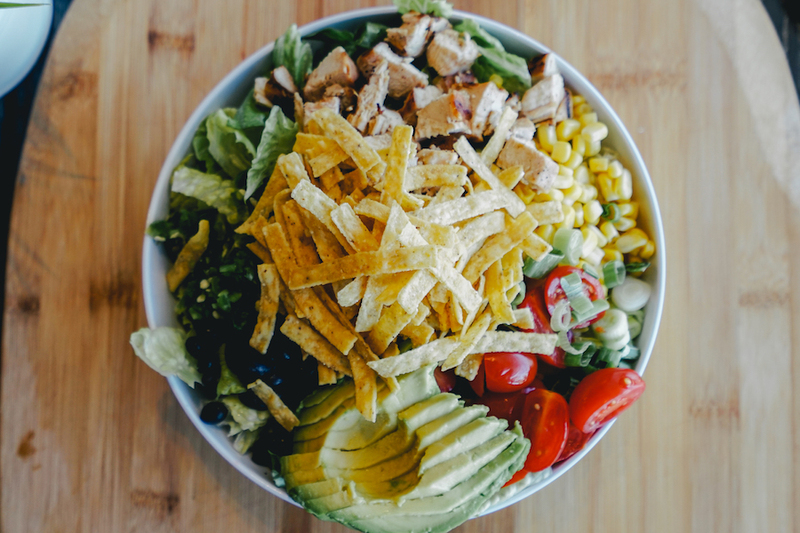 If you’re interested, our “Southwest Grilled Chicken and Wild Rice Blend” features a warm wild rice blend, grilled chicken, chopped romaine, avocado, jalapeños, tortilla strips, tomatoes, black beans, scallions, corn, shredded white cheddar, and lime cilantro jalapeno dressing. We hope you try it soon! Happy Eating!